Even though I haven’t worked on it for a long time, the site has been up and running (albiet a bit slowly due to the giant database). Sadly, I need to use the hosting plan attached to it for something jMockups-related, so HNTrends will be no more. Boris Dinkevich posted a good analysis of the HNTrends data on his blog. 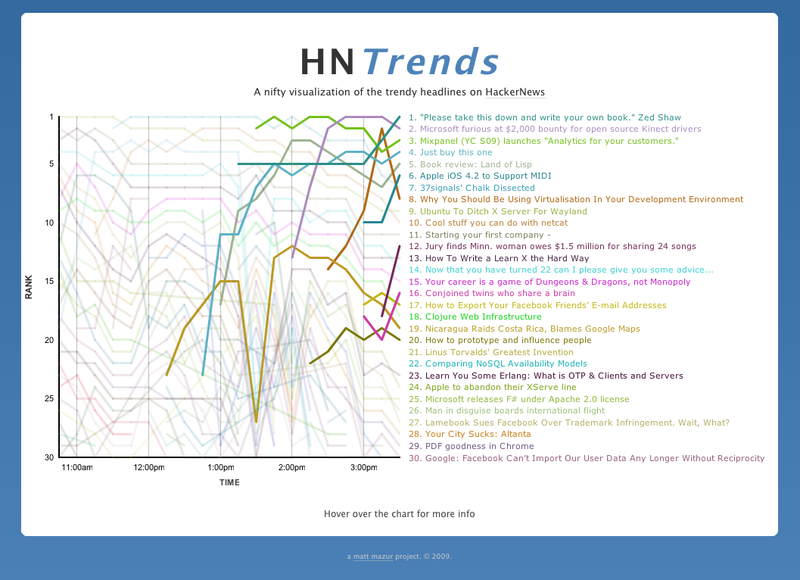 Back in September 2009 I launched a small web app called HNTrends.com, a tool for visualizing the movement of stories on HackerNews’s front page over time. I haven’t worked on the site much since then, but the script that logs the data has been diligently recording the front page submissions every 15 minutes since it started. It occurred to me that a detailed analysis of the data might yield some interesting results such as how the site has grown since then, when is the best time to post a new submission, user participation rates, or some insight that changes the way we see the site. I offer it to you today so that you may analyze it to your heart’s content. You can download it here (CSV, 13.4 MB zipped, 169 MB unzipped). In total, the database contains 514,478 records spanning from August 31, 2009 to March 7, 2010. One final note: this database covers roughly 99% of the time period since it started. For a while the script broke whenever an article didn’t contain comment link, and every so often it goes down for miscellaneous reasons. The idea for HNTrends has been bouncing around in my head for about a year as one of those man-I-wish-I-had-more-free-time-type side projects. I recently decided to take up learning Flash and ActionScript and this seemed like the perfect opportunity to build it. It’s fairly straight forward: A Python script scrapes HackerNews every 15 minutes and saves the data in a MySQL database. A PHP script queries the database and outputs the the last five hours worth headlines as neatly-formatted JSON data, which the chart grabs and plots. The older, less trendy news items are rendered with a slight transparency in order to reduce the chart’s business. You can hover over any of the lines to see it in greater detail. Also, if you click any of the points it’ll take you to the comments. The links on the right take you to the actual news articles.